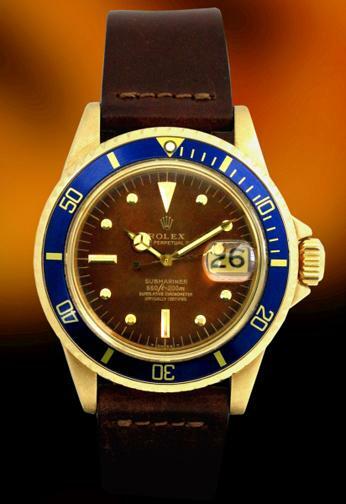 Rolex 1680 - Date Submariner, 18K gold Case, beautiful brown dial. This Rolex Submariner DATE was created in the 70s with the reference # 1680, corresponding to the Men's DATE with the case measuring 40mm. The bezel is rotating with a scale of 60 minutes, and the dial has a brown background with a triangular luminescent marker at the 12 o'clock. This example has an extremely rare perfect brown dial. Amazing piece!